Watch or Not? : When a film is titled What The Fish, it reads aloud the cue for you to make a dash for the next film-viewing option. An absolutely lame and ridiculous film barring Dimple Kapadia’s scorching screen presence, it makes no pretense about being utterly stupid. It is an empty film with no thrill, no excitement and mostly no fun. 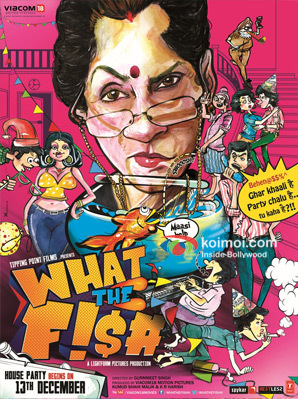 Sudha Mishra (Dimple Kapadia) is a monstrous maasi who is cranky, old and a recluse living alone in Vasant Kunj with her pet fish Mishti and her money plant. Extremly finicky and particular about every nitty gritty detail in her life, she embarks on the difficult task of leaving her house under the guard of her niece’s fiance for a month. The careless and irresponsible guy lets out the house to his friends and then their friends. In one month the house has multiple occupants, myriad stories and eventually the brunt of it is borne by Maasi’s favorite things – her pet fish and beautiful money plant. Does she return to a perfect house or all hell breaks loose when Maasi finds her house upside down when she comes back? Dimple Kapadia in a still from What The Fish! The worst thing about the film is its stale and trite writing. For a comedy, there were no cleverly written sequences. 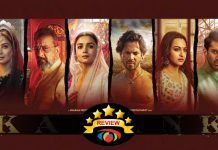 Though the film’s first half is better as compared to the drab second half, overall the script itself is extremely amateurish leaving behind a few dangling loose ends which make absolutely no sense at all. 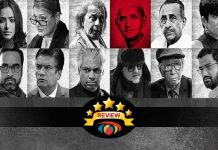 Luckily the writer spares us any overdose of melodrama and keeps humour coming in the regular intervals, but the jokes fell absolutely beneath the mark. The scriptwriters pines heavy expectations from the audiences. To survive this one, you must have ample reserves of patience. It is not only extremely flat but ridiculously un-entertaining. The story will befuddle you. An old, finicky lady decides to leave her precious home in the hands of her niece and her fiance. A careless young man that he is, the guy recklessly lets it out to a bunch of strangers. It turns out to be a shabbily written doomed story which doesn’t give you any opportunity to enjoy it. Luckily if you look too closely, you’ll find a flatteringly good concept which was butchered at the alter of lazy execution. The contrived work is definitely not welcome and since the offerings from it comes in bouts and are so rare that the story is better unforgotten. Dimple Kapadia as the lead lady is sincere and brilliant in her role. Though she doesn’t occupy a lot of screen space, she is crackling in the little time she is on screen. Her perseverent work is so impressive that you finally realize the unsaid rule about actresses who have once ruled the industry – they are made of an unbeatable mettle to have claimed the position they had. The rest of the team doesn’t even deserve a mention in this category. Coming across as a bunch of squabbling characters, they put up varied yet uninspired performances. Rendering no imagination to their respective roles, they are not un-watchable but definitely very forgettable. The heavy handed direction of Gurmeet Singh is the biggest misfire in the film. The director fails to reap out a substantial film from a well thought of concept. Though a large part of the fault lies with the weak story writing too, its messed up execution fails it terrible. There is not one character except Monster Mausi which the director etches out to perfection. With a weak casting, none of the other from the acting team manages to ham up their roles which eventually came across as flimsy. 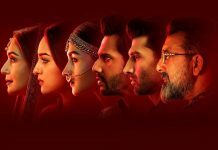 While the film’s first half still manages to get your attention with open eyes, don’t be surprise if you snore off in the later half with tracks getting more and more muddled up and dumb! Also, cinema’s insensitivity in portraying transsexual characters can be seen at it grotesque worst in this movie. A boxer who drapes himself in an anarkali suit and dances to kathak steps is shown in an extremely compassion-less light. It is easier to expect that filmmakers remain passive to issues they don’t feel closely about. But to poke a rude joke, so unfeelingly is both audacious and lowly. At its run time stretching over two hours there were barely any reason found that makes What the Fish a must watch. Be prepared to cringe through most of the spread and the humor dries up too soon leaving the film boring and drab. I simply squandered away into futility some precious hours of my life, I won’t ever see again. I will go with 1.5/5 for this humdrum, monotonous movie. What happened to cinema being a mode of enjoyment? What The Fish! releases on 13th December, 2013. Share with us your experience of watching What The Fish!.